The Oxford Oratory recently organised a week of fund raising events with an American theme, culminating in a dinner on Friday at Harris Manchester College,Oxford,which is twinned with Harvard University and the Catholic Boston College. £10,000 was the week's target towards the building fund, for a chapel dedicated to Cardinal Newman and a library to exhibit his work. The week began with a Cajun band, L'Angelus, from New Orleans, making their first visit to England, and included special guided tours by historian John Whitehead on Newman's Oxford and a talk on CS Lewis by Walter Hooper, his last secretary. Cecilia De Maria, 2008 BBC Young Musician of the Year finalist played the harp at a champagne reception prior to the college dinner. 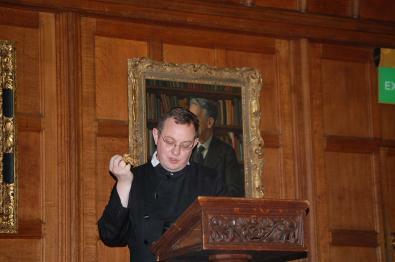 Fr Richard Duffield, Provost of Birmingham and postulator for Newman's beatification and making final plans to welcome the Pope in September, returned to Oxford to give the after dinner speech saying that from his recent visits to America he realised that Newman was loved even more there. “This love goes back to Newman's own time, expressed in the most practical terms by offers of financial help," he said. Fr Duffield, who flew to America on Sunday, to raise further funds, quoted from Newman's letter to the Archbishop of New York, in 1854, “Fundraising is a rather thankless task. I have found it is in some ways easier in America where there is a culture of unembarrassed generosity”. He added that it was New York Catholics who paid for Newman's' burial place. Fr Duffield then displayed an amazing ring sent by Californian Catholics to Newman in 1854 to help him cover costs from a libel trial. It was a gold nugget from the Californian gold rush, weighing over 17 ounces. Concluding with an auction led by parishioner Michael Welch, from the BBC Antiques Roadshow and Bonhams' auctioneers, the evening raised £3,767. Campaign director Fr Jerome Bertram said that a temporary altar and shrine for Cardinal Newman was being constructed and would be ready by September to be placed in the Oxford Oratory church, and finalised plans for the new building and Newman chapel would be unveiled at a press conference on 22 July.